One of Three in a series on Hawaii, links at the bottom. I visited Oahu in early April, a perfect time to go. In April, we had little or no rain, warm, breezy weather and pleasant evenings. If you absolutely want to see the whales, you need to go a little earlier. The whale watching season was at an end and we only saw one whale. 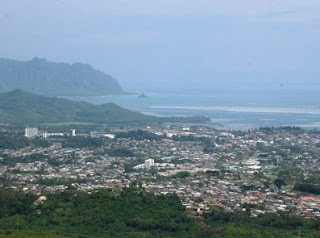 Kailua is an excellent area to stay if you plan to see the whole island. Kailua Beach is great for sunbathing and swimming, small waves, quiet area. This beach offers a spectacular sunrise. 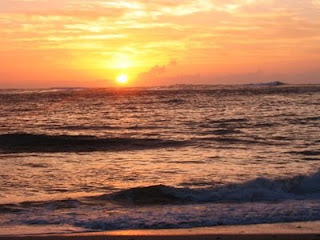 We were there for an Easter sunrise praise, worship & baptism service -- that’s hard to beat for a sunrise! The center of town offers some shopping and restaurants, a couple of mom & pop run bookstores and a Starbucks. 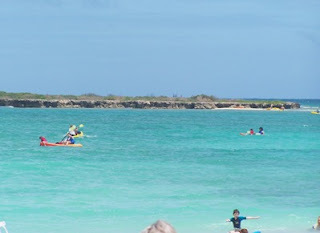 Between Kailua and Lanikai Beaches, you can find kayaking, canoeing, sailing, surfing, wind-surfing. We spent a half day doing some hiking in Kailua. There are trails on Mt. Olomana for serious climbers, but we hiked the Maunawili Falls trail. An awesome introduction to Hawaii! We hiked along streambeds where we saw Hawaiian fauna, we also went along the mountain top where we had great vistas. I was slightly disappointed in the waterfall. I imagined Hawaiian waterfalls like you see on TV, but this was just a tiny one, much like what you can find in the SC, NC or NY mountains. The trailhead was difficult to find and the trail was difficult to navigate, not well marked. 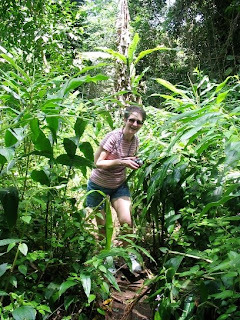 OK, OK, so we got lost in rain-forest type areas, I admit it. I only recommend the hike if you want to see Hawaii in its natural form, quiet, secluded and you want to get fresh air and exercise. Other hikes around Kailua include The Lanikai Bunkers Hike, short but steep, & The Kawainui Marsh trail where you can ride a bike or jog, but there is no shade. We didn’t do either of these trails. Kailua is on the windward side of Oahu. 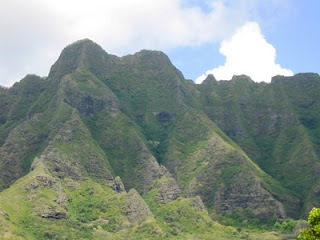 While in this area, you need to drive up the Pali Highway to the Nuuanu Pali Lookout. Pullover at the overlook and take a peek of the entire windward coast. The overlook is at the edge of the Ko’olau Range -- the remains of the Ko’olau volcano. The other part of the volcano slid into the sea a long, long time ago. Mark Twain calls this view the most beautiful in the world. Drive back past Kailua and on to Kaneohe Bay, home of 6 ancient Hawaiian fishponds &, more recently, host to several Karate Kid movie shots. This is where Rene, Heather, Andrew & I began our North Shore Drive. Andrew was stationed at the Marine base and had been there awhile, so he was our tour guide. You don’t need a guide, though, just get a good map. There is basically one road circling the outer edge of Oahu and one cutting straight through the center of the island. We took the outer road going up. Starting out, you can see Coconut Island where the opening shots to Gilligan’s Island were filmed. Looking past the white beaches, you can see the marine base in the horizon and Chinaman’s Hat a little to your left, it rises to 206 feet. (pictured here) The beach here is pebbly; the water, crystal clear. 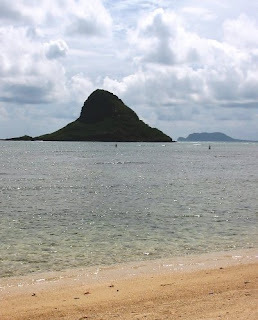 During low tide you can walk across to Chinaman’s Hat. If you’re not careful, the tide will rise and you will get stuck there. We cooled off and walked through the shallow water. We continued driving up the Winward coast and passed Haloa Ridge, the spectacular mountains where a lot of Jurassic Park was filmed. Jualoa Ranch hosts a Jurassic Film Tour, which I did not take, but Rene’ and Heather later did and said it was pretty good. This drive up the Winward coast is well worth your time. You can drive up and back in one day and see all the sights, but if you can spare two days, stay overnight in Haleiwa and drive back to Kailua the next day. Driving up, we stopped at Pounder’s Beach, Turtle Bay, Sunset Beach and Ehukai Beach. Pounder’s Beach and Turtle Bay are rocky and choppy, absolutely beautiful. Sunset and Ehukai are the winter surfer’s paradise where world championship surfing contests take place. There were a few surfers out there and a few professional photographers lined up on the beach with huge telephoto lenses and gear. Then there's me and Rene' with tiny little digital cameras, snapping photos left and right with me periodically slapping my malfunctioning, broken camera and yelling "stupid!" 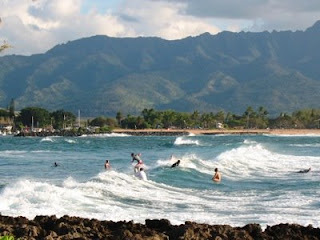 The shoreline consists of areas called "Gas Chambers" and "Bonzai Pipeline" which are rather famous to surfer dudes. I overheard surfer dudes STILL talking about a world famous #1 best surfer who was killed here in a big wave many years ago – maybe in the 60’s? Driving up the coast, we were suddenly turned back by "rock slide" and "closed" road signs. Ethel says, "Luceeeeee, you got some 'splaining to do!" Ethel is not happy. We turned around and I studied the map, furiously trying to find a way around the detour to continue the North Shore drive. Alas, there is no detour. Heather and Andrew are cranky and want to be fed. I want to see more big waves. OK and maybe some more surfer dudes, let's be honest. There is no place to eat. We drove halfway back down coast to find the only restaurant -- a McDonalds hidden away in an obscure motel. Yay! Rene's favorite -- McDonald's. If you take this drive, don’t go hungry. Eat before you go and take a packed cooler. We dropped Heather and Andrew off back at "home" and then Rene and I headed back up the center of the island to see the rest of the North Shore drive from the opposite direction. We drove through a coffee plantation and past the Dole Plantation. We stopped in Haleiwa. Shopped and looked around. Drove along the coast to Waimea Valley Audubon Center and saw the peacocks. We didn't pay to enter park since it closed in 30 minutes, but I recommend you do, it looked good. This was the final spot to see before the road closed on the opposite side of the rock slide. We drove straight home after dark and got silly and giggly and lost. This, my friend, is how you spend two or three days in Kailua, the Winward and North Shore areas. VRBO – Vacation Rentals By Owner – found a wonderful, small apartment for us in a safe. homey neighborhood at the base of Mt. Olomana, just off the Pali Highway in Kailua. A perfect location IF you have a rental car, which we did. In the mornings, I had my coffee on our private patio, where I could gaze at the mountain and dream. I work for HomeAway and am glad to hear your stay at a Hawaii VRBO property was such a success! Because you had such a good experience, I thought you may be interested in the contest we are hosting for bloggers in which you could win a $5000 stay in the HomeAway rental of your choice. Visit blog.homeaway.com to find out more.